Hydropower accounts for around 45% of electricity generation in sub-Saharan Africa (SSA) while biomass (mostly firewood) constitutes about 56 percent of all energy use in sub-Saharan Africa. Large-scale use of forest biomass is accelerating deforestation, and the World Bank estimates that 45,000 square kilometers of forest were lost between 1990 and 2005 across all low-income countries in Africa. Africa has huge renewable energy potential with some of the world’s largest concentration of alternative energy resources in the form of solar, wind, hydro, and energy. Overall, 17 countries in sub-Saharan Africa are in the top-33 countries worldwide with combined reserves of solar, wind, hydro, and geothermal energy far exceeding annual consumption. Most of the sub-Saharan countries receive solar radiation in the range of 6-8 kWh/m2/day, which counts among the highest amounts of solar radiation in the world. Until now, only a small fraction of Africa’s vast renewable energy potential has been tapped. 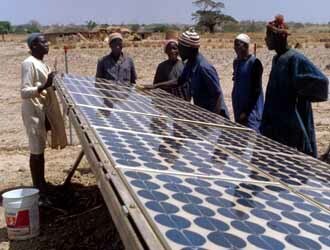 The renewable energy resources have the potential to cover the energy requirements of the entire continent. Infact, Africa is home to seventeen of the top-20 biomass users in the world. Traditional biomass (predominantly fuelwood), accounts for 70-90% of primary energy supply in some SSA countries. Several African counties, such as South Africa, Egypt, Morocco, Kenya, Senegal, Madagascar, Rwanda and Mali have adopted national targets for renewable energy, and feed-in tariffs for renewable energy electricity have been introduced e.g. in South Africa and Kenya. Countries such as South Africa, Morocco, Egypt, Cape Verde, Ethiopia, Kenya and Tanzania are developing wind farms. Geothermal investments are increasing in the Rift Valley area of Eastern Africa. The pipeline of investments in Africa in hydropower, wind farms, solar PV and concentrated solar thermal, geothermal power and biomass energy underlines the huge potential for a future expansion of renewable energy across the continent.